ABE (All Black Everything) by Applied Nutrition - Big Brands, Warehouse Prices! If it’s time to turn up your workout intensity and flip the switch to overdrive, then ABE by applied nutrition deserves your attention. If you’ve been on the hunt for a no-nonsense pre-workout that maximises your full training capabilities and does not mess around then give this a try. Containing only the most vital and well researched ingredients this product speaks for itself and is designed to get you dialled into your workout, performing at your best by enhancing focus and making sure fatigue is kicked to the curb. With the added effort you will be able to put into your workouts, it’s only a matter of time until you reach your training goals and step up to the next level. What are some of the key benefits you can expect to receive when using this pre-workout? What will some of the ingredients in ABE offer you? Beta-Alanine raises muscle carnosine concentrations which is crucial when it comes to using lactic acid for energy in muscles which will allow you to train harder and longer. Theacrine is known to increase mood and energy and extends the effect of caffeine while also minimising some of caffeine’s side effects, such as the jitters and elevated heart rate. ABE combination of powerful stimulants, nootropics and compounds that are associated with nitric oxide production makes it one of the top pre-workout supplements on the market. NOTE: ABE contains 80mg per scoop of Vitamin B3 or also known as Niacinamide (Niacin). These side affects are harmless and typically subside after a short period of time. Tolerance to niacin can also be developed, so the more that is taken over a period of time, the side affects lessen. Mix 1 Serving (10.5g) with 250 ml of cold water and consume 30 minutes before exercise. 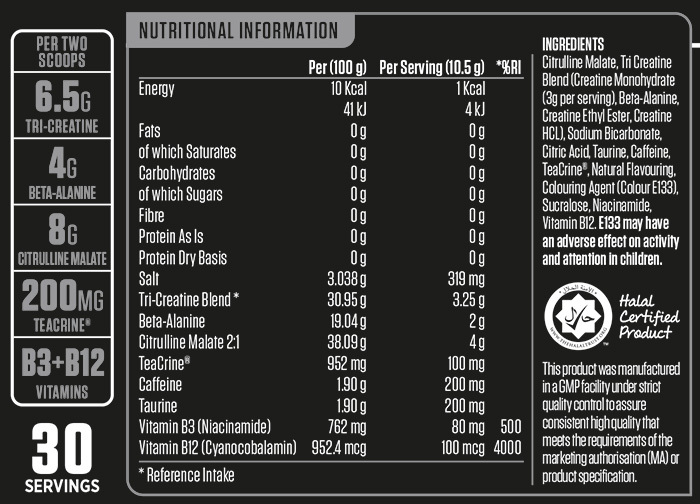 Contains 200 mg of Caffeine Per Serving. Very impressed with this product, Applied have only used well backed ingredients, no fluff. Heavy niacin flush, so I would advise not to have it on an empty stomach like I did!